3 Essential oils to help detox the skin. - Amphora Aromatics Ltd – Supplier of pure essential oils and aromatherapy Products. 3 Essential oils to help detox the skin. If we’ve overindulged over the Christmas, our skin can often suffer and show the signs. The cold weather can also cause havoc and leave our skin in need of some serious TLC. Luckily there are lots of ways we can help revive and rejuvenate our skin, getting it ready for the New Year. We’ve got together a selection of all natural recipes using three key essential oils renowned to help detox the skin and help you feel revived and renewed. 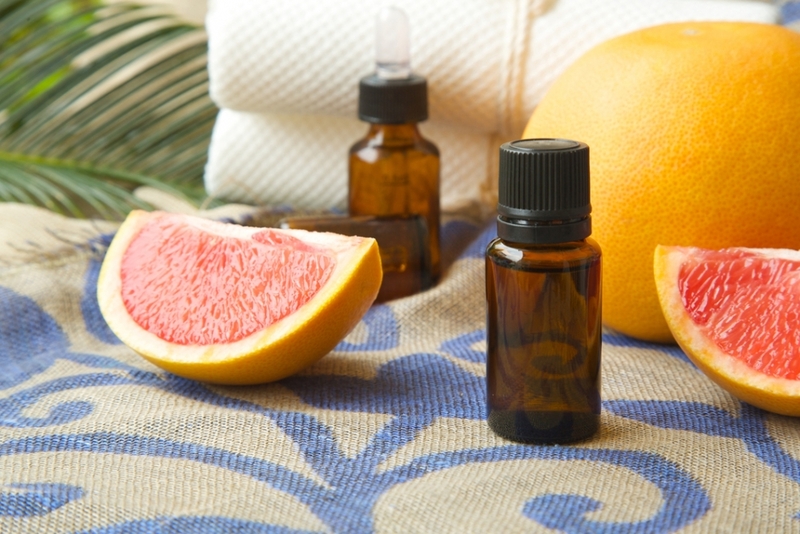 The salicylic acid in Grapefruit means it can work wonders to help combat oily skin. Its antioxidant properties help to detox the skin, leaving it feeling brighter and more radiant. What’s more, its wonderfully sweet and fresh aroma makes it renowned as one of aromatherapy’s ‘happy oils’. It’s therefore a great one to use to help beat the January blues!! Try mixing one cup of demiera sugar with a third grapeseed oil and 15 – 20 drops of Grapefruit essential oil. Place into an airtight jar and use the mixture as a gentle exfoliating facial scrub. Moisten the skin with water and using your fingertips, apply a small amount of the scrub to your skin using circular motions. This gorgeous scrub will help unblock pores and remove dead skin cells, leaving your skin feeling smooth and fresh. Juniperberry essential oil is known for its natural detoxifying properties. It’s a great oil to use to help your body recover after overindulging during the holidays (plus it’s known to be a natural hangover reliever!!). Juniper is another great oil for helping combat those with an oiler skin type. It’s also a natural astringent, meaning it can help reduce redness caused by breakouts. You can enjoy the great benefits of this oil by using it in a face serum. Serums are an incredibly effective way of treating the skin as they can penetrate the skin deeper than your standard moisturizer. Known for its detoxifying properties, Cedarwood oil can have a gentle stimulating effect which helps to break down and eliminate toxins in the body. It acts as a natural antiseptic and anti-inflammatory, so it can be useful for treating acne and other skin complaints. A great way to make the most of these properties is to use it in a gentle exfoliator. Exfoliating the skin helps to remove dead skin cells and helps promote healthier, softer, smoother skin. For the ultimate skin detox, you can try blending Cedarwood Atlas Oil with some Epsom salts (renowned for their detoxifying and exfoliating properties), along with a carrier oil of your choice. 15 drops of Cedarwood Atlas Essential Oil. 15 drops of Bergamot Essential Oil. Simply combine the ingredients in a mixing bowl until you’re happy that they’ve blended well. Scoop into a container and enjoy using in the shower or bath. Apply to wet skin in gentle circular motions and wash off with warm water. Here you have just a few simple ideas on how to kick-start your skin for the New Year. We hope your new year is getting off to a good start and the resolutions (if there are any) are going well :). Keep your eyes peeled for more to come over the next few weeks.